Facing a divorce, a criminal charge, or recovering from an injury caused by someone else is stressful enough. Working with an attorney should not add to your stress level. You need a lawyer who not only is competent and professional, but who will also listen to you and involve you in your case. 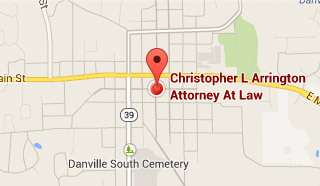 I am proud to help the residents of Danville, Plainfield, Avon, Brownsburg, and the surrounding communities in legal matters concerning divorce, personal injury, child custody, criminal defense, OWI, and more. I work to maintain a casual, approachable atmosphere through which we can solve your problems. I’m committed to providing the highest quality of legal services to my clients in a cost-effective manner.